Chinchwad branch had organized a 4 day Cyclic meditation camp from 20/03/2017 to 23/03/2017 at Dhokha Pratishthan Chinchwad which was conducted by Shri Vishwasji. We had an overwhelming response for this program and over 150 people attended all 4 days regularly. ​The good comments from the people and desire of some participants to join our organization means a lot to us. We are now in touch with the Police department here to give them a training session on Cyclic meditation looking at their busy stressful life full of tension. 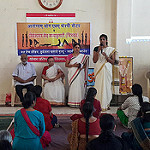 W​e would ​like to thank all the karyakartas for helping and making this program a big success. Also we would like to thank Mr. and Mrs. Dhoka for arranging a big hall for this session free of cost.